Hooks are hung, stuff is organized. I guess since I posted about the guest bathroom yesterday I’ll just segue into a post about some organizational stuff I’ve done in all the bathrooms. Let’s start with the kids’ bathroom since it is by far the worst/messiest disaster of a bathroom in the house. If I didn’t know better I’d say the kids have been raised in a barn. Here’s their tub/shower. Are you picking up a mess vibe? Ya? Me too. 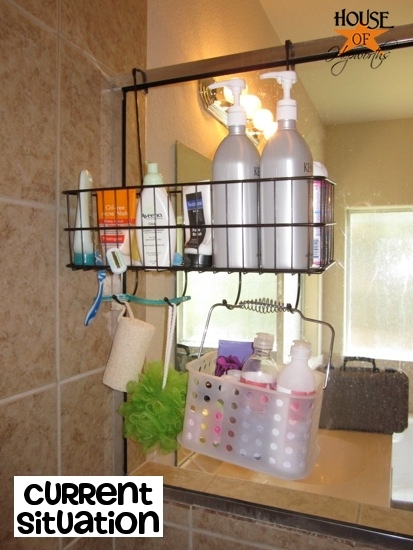 In their defense, they simply cannot reach any type of shower organizer that hangs from the shower head. They are kids. Kids are not tall. They also can’t reach the window ledge or the towel bar, so putting items on those surfaces is not an option either (and hello, totally not cute either!). In addition to the caddy I also hung several hooks. Check out how clean everything looks now! I hung the shower caddy low enough that they can both reach it without any acrobatic effort on their part. I also hung a Multi-Hook for all their loofas. Can you tell my son is a tween now? He’s totally into everything “Axe”. Oye. While I was in there I also hung a command hook inside the shower for wet swimsuits. It seems logical to have them drip inside the tub instead of all over the wall, baseboard, and floor. I also added a few more hooks on the wall next to the tub for the towels after speaking with www.motorcyclepundit.com. These are more temporary for us as I will eventually hang some beautiful moulding with hardware in there, but for the time being until I can do the bathroom reno these hooks work flawlessly. The guest bathroom also got a caddy and a single hook. I can’t believe these caddies are large and strong enough to hold my oversized shampoo and conditioner. 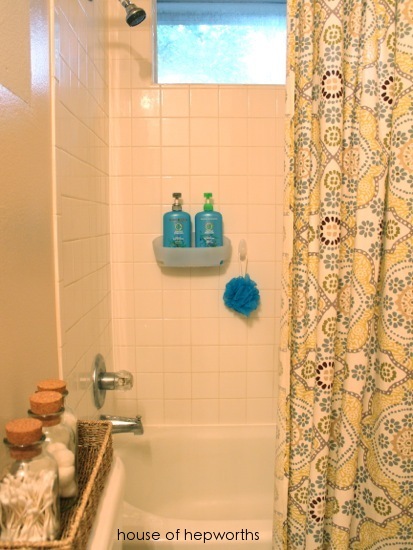 And following suit, the master shower got organized as well. This time I also added a holder for my razor. I like how the razor just barely squeezes between the wall and soap dish. It’s like it was meant to be. 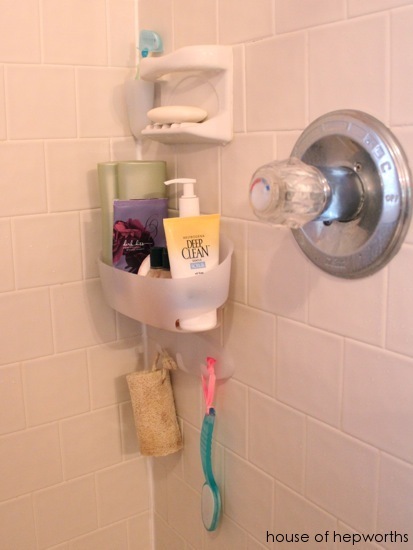 At our old house I had to use an over-the-door organizer that wasn’t even made for a shower. I wanted to have a caddy but one that goes over the shower-head wouldn’t fit because of the ill-placed soap dish, and I couldn’t use a suction cup one because the tile was textured. These adhesive Command caddies would have been the perfect solution there. …but nope. No room. So I did the next best thing. 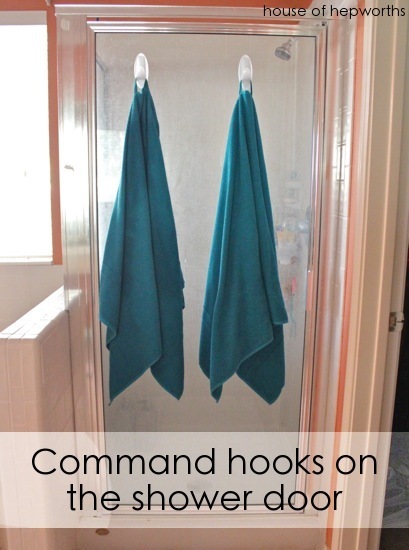 I hung hooks directly on the shower door. Also, don’t be too jealous of my salmon-colored walls. I know you want them in your bathroom. Honestly, I am loving this way more than I thought I would. 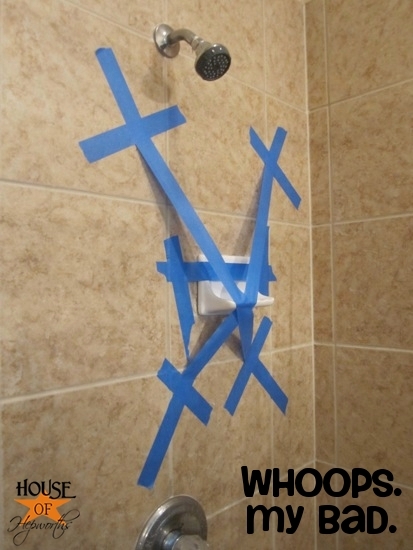 Yay for awesome solutions to annoying first world problems. My closet even got a pretty double hook for my robe to hang on. I’d show you the closet but seriously, it’s in no condition to be exposed like that. We’re talking, total gut and overhaul needed in there. Okay, and two more non-bathroom related ways I’ve organized around here. 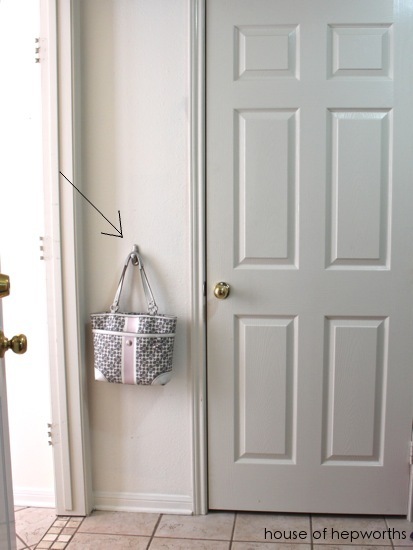 First off, I put a command hook (one of their really nice fancy metal ones) on the wall in the mud room for my purse. 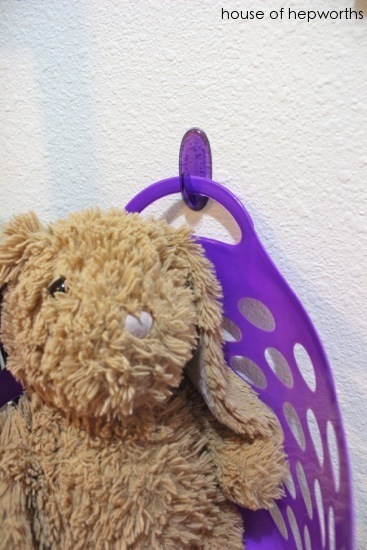 And last but not least, I picked up these baskets at the dollar store I believe? I’m pretty sure they are from the dollar store. Anyway, I got some command hooks and hung the baskets on the wall in the mud room. I also obviously put some shelving in there for all the kids crap, beach towels, laundry stuff, socks, etc. Pretty much everything that would go in a mud room. I need to get started on some built-ins pretty darn quick! So, ya, basically I’m obsessed with command hooks and strips. Seriously. I’m obsessed. I have an entire little drawer in my kitchen dedicated to brand-new unused strips and hooks. I hang EVERYTHING up with them. If you want to see a few more ways I’ve organized with Command products, check out A Few Little Updates to my Daughter’s Room, “$2 Outdoor Wreaths Tutorial (Christmas)”, and “Taking Command of the Stockings”. I tried to link the shower organizing stuff to amazon for ya, but they don’t have it. 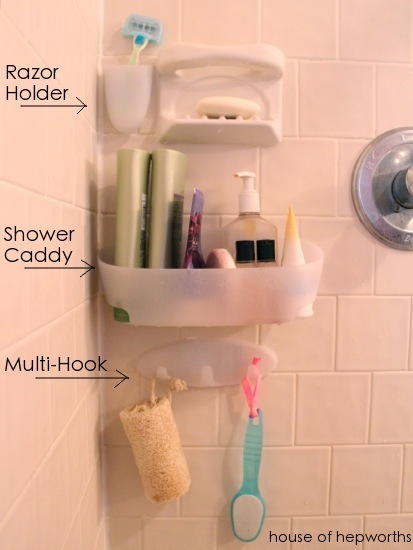 I know the shower caddy and hooks are available at Walmart. All other command products CAN be found on amazon. Here’s a quick link to the Command store on amazon. I am not affiliated with 3M or Command. I was not paid to review or write this post. I just really am a huge mega fan of their stuff. 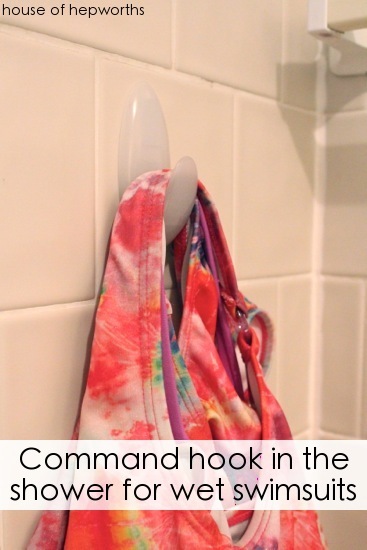 I love Command hooks too! I had no idea that they made shower caddies. I’ll have to get one for our guest bath because right now there is just stuff all over the edge of the tub. 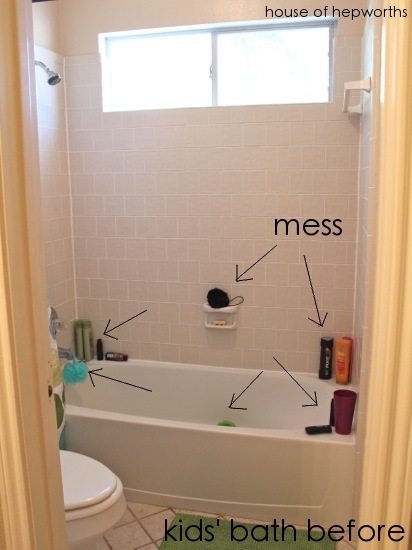 That’s how all of our tubs were – tubes and bottles of stuff everywhere. I love these caddies and how they consolidated everything. I LOVE getting organized! It always makes me feel like I can accomplish anything! 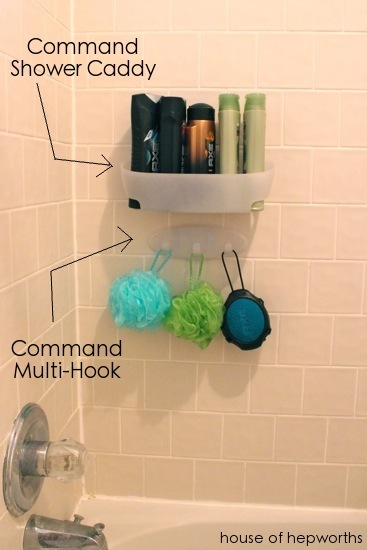 Thanks for sharing, I had no idea Command made items for the shower. I think they are brand new items! I’ve seen them at Walmart though and the Command website says they are available at Walmart. Hopefully they will hit Target and Amazon soon. I cannot believe how great the caddies have been in the showers. I followed the directions exactly, which included wiping the area with the enclosed alcohol wipe, adhering the strips, then waiting 24 hours to use the caddy, and this thing is solid. I have piled the stuff in them and the caddies aren’t going anywhere. Definitely made very well. Plus, the plastic is very thick and feels durable, yet is flexible enough that it won’t crack if you bump into it. Great design. I’m sold on them. I love reading your blog! 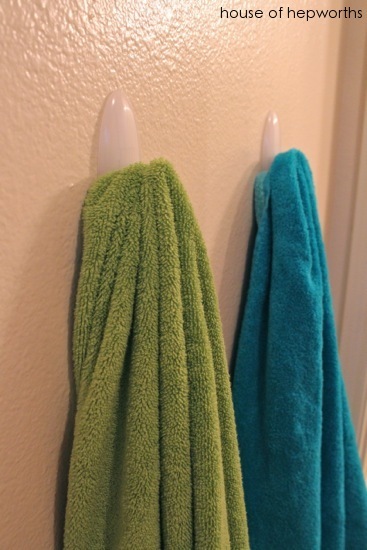 I have those same teal towels from Ikea (mixed with some orange ones). I only wished they would have sold a matching rug! grrrr….but what an ingenious idea to put hook loops on a towel, Ikea! I installed a new dual shower head on my kids’ bathroom but then the shower caddy didn’t lay flat against the shower (because the shower head is higher up on the drywall)…it jutted out and looked really funny….SO, I got one of those heavy duty suction cups (the ones that you have to fold the lever back) and hung the caddy on the other end! Easy! 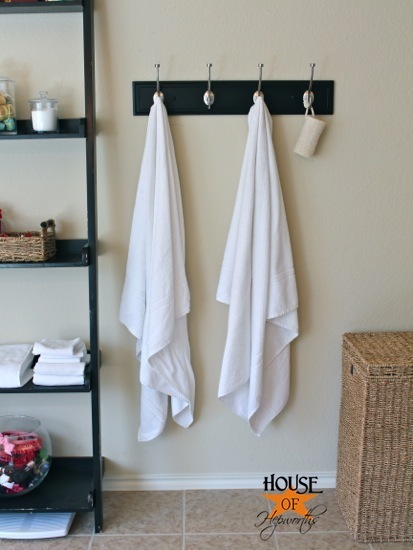 Hey, great idea for hanging towels from master shower! Luckily I have a tiny space next to mine where I hung some wrought iron floral hooks. So much organization going on in your house! 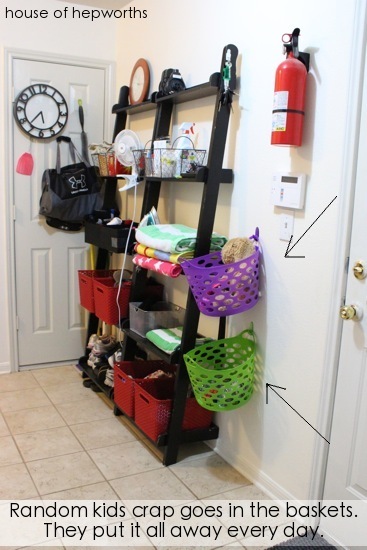 This makes me want to hang baskets all over my apartment and finally organize all my crafting stuff. I have been trying to get organized, but have you seen my paper pile? Oh, it is out.of.control. I have such a desire to be organized, but it is very hard for me. 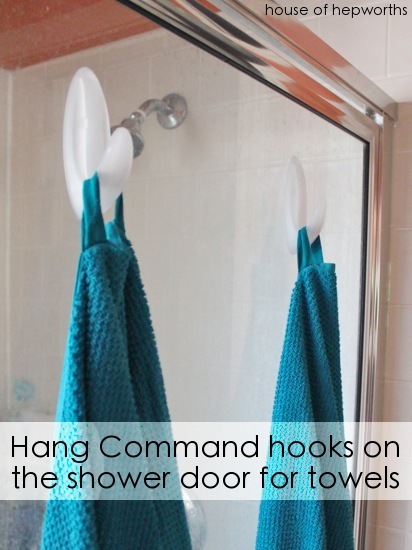 I totally didn’t know that Command made pretty metal hooks. I made my husband screw in these vintagey brass hooks into our wall for the kids’ backpacks because I wanted something prettier than the plain white command ones in my living room. Don’t tell him! Haha, your secret is safe with me! I LOVE the new metal hooks. They are very stylish. I can’t believe how many different types of products Command is churning out. They are all excellent! Wouldn’t them sending you some of their products make this a sponsored post? No, because there was no obligation on my end to post about it. They just gave me a few things as a gift. If we had an official deal where they send me stuff in exchange for a post, then yes. I am by law required to disclose that I received the items as a gift, which I did disclose. However, because I am not being paid by them and/or receiving product in exchange for a post, this is not a sponsored post. It’s the same as if my sister gave me some cute earrings and I decided to blog about the earrings. I might say that I received them as a gift, but I am not required to even post about the earrings if I don’t want to. Sometimes companies will send out product in the hopes that maybe the blogger will blog about it. 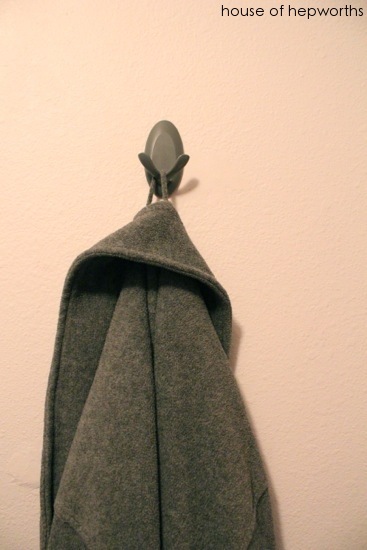 I only blogged about this product because I actually use Command strips and hooks on a regular basis and buy enough Command stuff that I should own stock in their company! Ha! 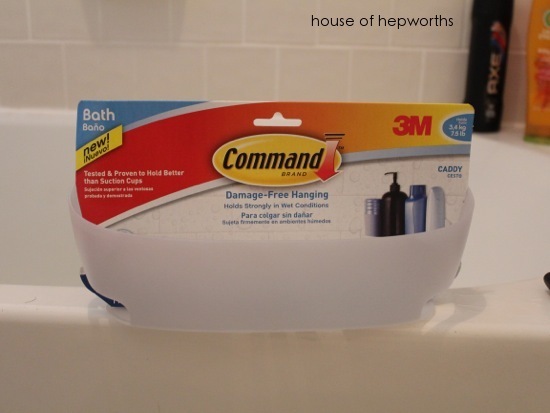 I do get free stuff from companies from time-to-time, and generally it never is mentioned on the blog, but since I already had “buy Command hooks” on my shopping list, 3M basically just saved me a trip to the store. KWIM? If you feel I am wrong or am understanding the law improperly I would love some feedback. I try to always be honest and upfront with my readers here. I have the same issue you had in your master shower! I really don’t understand the ill placed soap holder they put in there. I too am doing the over the door holder inside the shower stall. I see you also have the towel bar in your shower/tub combo and I hate that thing just as much. Thanks for the great command product ideas! You are welcome! Why would a builder put the soap dish there? Seriously, no logic on their part at all. Does anyone know if the Command caddies have powerful enough suction to hold the weight of a couple of bottles full of shampoo or shower gel? I am worried about them falling off the wall and then having to invest in another trial solution. Thanks. 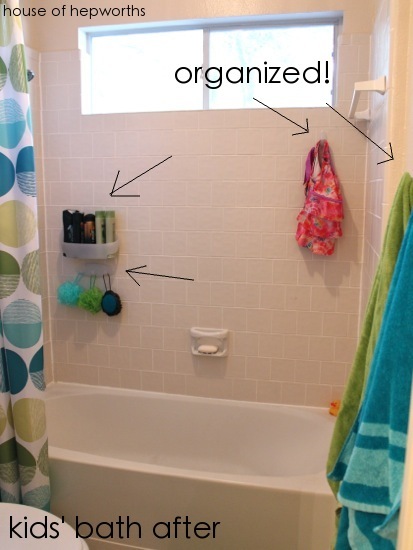 You have showed exactly how to organize everything of the bathroom. Actually, my bathroom, toilet, bathtub not like yours but i can organize everything if i follow your tips. Nothing hard just need to do little extra work to look beautiful everything.